Far from the buzz of Tokyo and the tradition of Kyoto, the Ise-Shima National Park is home to rolling hills, shimmering waters and sacred shrines. Overlooking it all, Amanemu redefines the notion of rural hideaway with ancient tradition given a touch of flashy modernity. A hot spring sanctuary where natural surroundings take centre stage, this exclusive retreat with just 28 suites and villas, is a haven of peace and tranquillity. In the south-west of the main island of Honshu, Ise-Shima National Park is a welcome change of pace. Packed with cultural treasures, spend your days wandering the ancient Kumano Kodo pilgrimage trails, visiting the holy Shinto site of Ise Grand Shrine and exploring the ancient ama lifestyle on the calm waters of Ago Bay. Easily accessed by a short helicopter flight from Nagoya Chubu airport or a bullet train to Kashikojima Station, Japan’s quiet side is closer than you think. We always love a hotel where a suite is considered entry level. 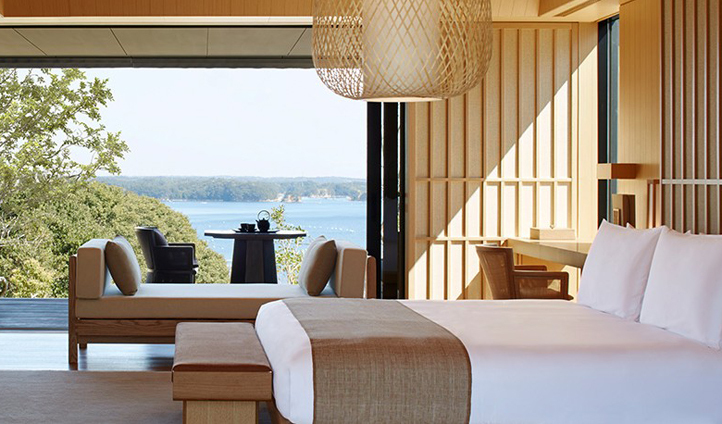 At Amanemu, there is no such thing as a conventional guest room – just suites and villas. Inspired by traditional Japanese villages, these 28 suites and villas are a contemporary interpretation of Japanese Minka homes. Light and bright with high ceilings and timber floors, you’ll enjoy uninterrupted views of luscious greenery and the blue expanse of Ago Bay, dotted with its verdant islets and pearl rafts. The perfect retreat that you’ll never want to leave, enjoy king-sized beds, expansive terraces, a private onsen and handy fire nooks for those cooler months. 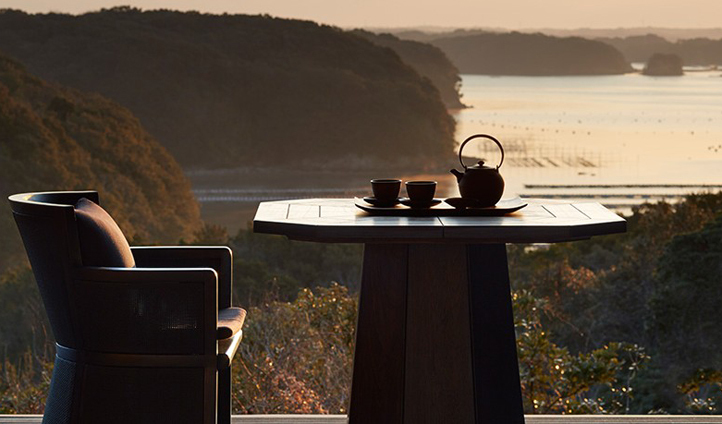 A stay at Amanemu is all that’s needed to get your zen back. Embrace the ancient Japanese bathing tradition of onsen where natural mineral-rich waters and thermal springs create a soothing environment in beautiful surroundings. Believed to have a range of healing powers, the onsen is an experience not to be missed. Nor is fishing for your own tempura or sashimi. Head out onto Ago Bay with an expert angler and reel in a spiny lobster of two and allow the chefs to do the rest. Bringing out the best of local flavours, the Japanese Restaurant showcases the region’s rich gourmet heritage.